The kitchen at Our Lady of Mt. 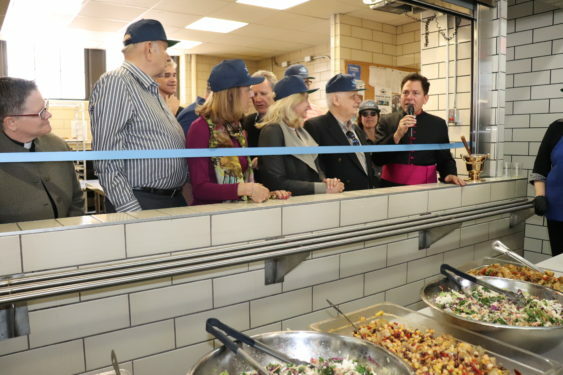 Carmel, Williamsburg, which makes 950 meals every week for struggling Brooklynites, was blessed April 30 just before the official ribbon cutting. Msgr. Jamie Gigantiello, pastor, said a short prayer before he sprinkled the kitchen with holy water in the presence of local politicians, religious leaders from various faiths, business owners and people of good will. The parish kitchen was converted into a working industrial kitchen at the beginning of the year for North Brooklyn Angels, an independent local charity. 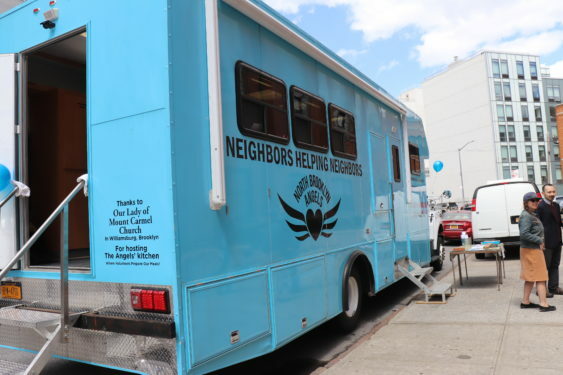 The year-old organization brings food to people struggling to make ends meet via the Angelmobile, a food truck dedicated to giving out free lunch and connecting people to services they may need. The North Brooklyn Angels used to buy food from St. John’s Bread and Life, but it soon grew large enough to have its own dedicated kitchen. Our Lady of Mt. Carmel had a kitchen, in need of some major work, but a kitchen that would do. When the North Brooklyn Angels approached Msgr. Gigantiello to ask for the space, he was all for it. He said he wants the church to be a place people can turn to in time of need, spiritual and physical. With fundraising and the will of good people, the kitchen was renovated complete with all approval and necessary certification from the city. The kitchen even received a total of zero violations during its first health inspection. Josh Cohen runs the kitchen like clock-work. He is there by 7:30 a.m. six days a week. The chef and local restaurateur works as a volunteer and helps other volunteers feel safe and comfortable in what they are doing. He makes schedules and checklists, ensuring that food is ready for pick up every day at noon. However, Cohen sees his task as more than just ensuring that there are 950 hot meals prepared every week for people who need them. He wants to make sure they are healthy, nutritious and tasty. It would be cheaper to used processed food, he said, but that would go against the spirit of the project. He wants to make sure that his neighbors are offered food that is good for them, not something that can make them sick in the long run. Cohen also sees it as the call of any hospitality business to expand the palates or experiences of the people it serves. As a chef, he wants to introduce people to new foods. Therefore he adds things such as kale to the lunches, making sure to pair it with cheese so that it may be more accessible to the people who may never have eaten it before. Ultimately however, Cohen, who is a practicing Catholic, said his motivation for being involved is simple. “I do it because I can,” he said. He has the time and means, so why not help out his neighbors. That is the center of North Brooklyn Angels philosophy said Neil Sheehan, co-founder of North Brooklyn Angels and Bread and Life, which now operates out of St. John’s University. It is neighborly camaraderie that brought on the project in the first place. Ryan Kuonen, executive director of North Brooklyn Angels, speaks with Currents Correspondent Konrad Aderer, in front of the Angelmobile, which distributes 950 free hot lunches every week. The Rev. John Merz from the Episcopalian Church of the Ascension in Greenpoint had to make the hard decision to close his food pantry when the upkeep of the building just became too much for his parish to bear. He discussed the problem with his friend, Sheehan, at a local McDonalds. The men decided that the need was still great but perhaps a brick and mortar soup kitchen or pantry was not the best way to meet it. That was the beginning of North Brooklyn Angels. Rev. Merz said the organization has become so much more than his original food pantry. It can now service people who do not know about food aid programs in churches, or who may not be comfortable or able to go to a specific church. The Angelmobile comes to them and is visible in the street. Furthermore it runs without being dependent on any one single community or person. Groups and parishes can pool resources together to help and if one is no longer able to help, the whole thing does not fall apart. Being mobile allows North Brooklyn Angels to come to know their neighbors on a deeper level, interacting with them in their own neighborhoods, Rev. Merz said. Being independent, encourages many local groups to pitch in, growing in relationships and love for neighbor. Being independent is one of the major benefits of the North Brooklyn Angels in this day and age said Executive Director Ryan Kuonen. She is the only full time paid staff member of the organization. She said when people move in to a new neighborhood they do not immediately go join their local church to grow in community that way as they may have done in the past. Therefore, she said, it is time for food services to reflect that change and come to the people where they may be. Although they partner with many religious organizations, such as Our Lady of Mt. Carmel, and many of their volunteers are from faith-based organizations, being independent gives them a wider net, she said. Kuonen also sees the work of North Brooklyn Angels as more than just providing people with a hot meal. She works with farms to make sure the food is healthy and she works with other organizations to make sure the people she helps feed also have access to any other help they may need. Of course, for all this to be possible, the organization needs hard cash, which all comes from donations, big and small. Some give to pay for one meal, $4, and some give enough to pay the bigger expenses. That’s where Norm and Elaine Brodsky come in. They lived in the area for 14 years and invested in property there when it was much cheaper and built warehouses. They have since relocated but still feel a deep connection to the area and the people, who they see struggle with rising housing costs. They invested heavily into North Brooklyn Angels believing the group can make a real difference in people’s lives, people who used to be their neighbors. Norm said he hopes the group will be a model for other neighborhoods. Elaine said that giving to others who find themselves in a tight spot brings more joy than any high-end purse or piece of jewelry ever could. Kuonen said people truly appreciate their efforts. Some even as they are standing on line to receive food, which can wrap around the corner, ask if they can help serve food as well. Maria Zorrilla said it is unclear which side receives the greater gift, the people waiting on line or the volunteers in the food truck. Being on medical disability, Zorrilla is unable to work, but she volunteers twice a weeks with the Angels. It gives her a sense of belonging and family away from family. She is a single mother and her daughter is almost fully-grown. Being out in the Angelmobile gives her a chance to connect with people and truly feel part of the community. During the ribbon-cutting ceremony, Felice Kirby, special projects director, stressed that people from all walks of life are invited to be part of the North Brooklyn Angels. Although people are always needed to serve and prepare food, that is far from the only need the organization has. The organization has already been the beneficiary of people offering their photography, film, social media and many other such skills and is always looking to expand its network. Kirby encouraged all to reflect on how they personally can use their talents, treasure and time to help their community.